THE TAOISEACH CONTINUES to move his news consumption habits from print to online to save some cash. 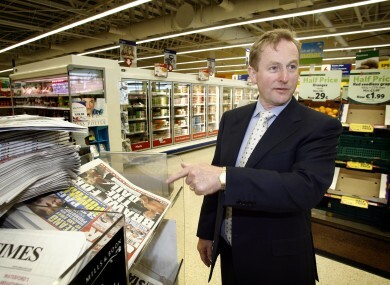 Earlier this week, Enda Kenny was quizzed about how much was spent on daily newspapers in 2015. Independents 4 Change TD Clare Daly asked the parliamentary question, stating that there were “far cheaper online alternatives” available to the Taoiseach’s office than buying print newspapers every day. She asked him to address the issue. The Taoiseach said his department spent €72,827.21 on print newspapers (including daily, Sunday and weekly papers) last year. “This compares to a spend of €109,330.76 in 2008 when my department undertook a review of its expenditure on print media,” he added. On foot of this review, my department rationalised its subscriptions and availed of a number of online subscriptions which resulted in expenditure savings. From 2008 until last year, a total of €36,503.55 has been saved from switching online. Kenny said his department liaises closely with the Office of Government Procurement on all matters related to public procurement and monitors all areas of expenditure – including on print media – on an ongoing basis to ensure that value for money is being achieved. Throughout 11 departments, a total of more than €200,000 was spent on print newspapers in 2015. This does not include online subscription fees. The Minister for Finance Michael Noonan said his department spent €13,917 on daily and weekend newspapers in 2015. He said a mixed model involving the purchase of physical copies and online subscriptions to specific newspapers is considered to be an appropriate use of resources. The Department of Education spent €8,959.58 but explained the expenditure on newspapers and magazines is kept to a minimum. The Minister for the Environment Simon Coveney said his department avails of an electronic press cuttings service which serves for most of its “printed media monitoring needs”. In terms of hard-copy printed newspapers, the cost of purchase which includes expenditure for Met Éireann, totalled about €9,830 last year. In general, the department relies on online versions of the daily newspapers, but not all newspapers have an online presence. In addition, it should be noted that there can be differences between online and printed content,” the department’s statement read. Minister for Social Protection Leo Varadkar said his department “closely monitors” its expenditure. The cost of newspapers purchased by his department in 2015 amounted to €8,335.33. The Department for Arts, Heritage and the Gaeltacht spent €8,269 on daily newspapers in 2015. Digital subscriptions are also used and expenditure on these in 2015 came to €448. Minister Heather Humphreys said savings are being explored by her department on an ongoing basis with a view to reducing costs and achieving greater efficiencies. The Minister for Health Simon Harris said his department spent €12,658 on daily newspapers. This expenditure, as with all expenditure, is kept under review,” he said. Agriculture Minister Michael Creed said his department spent €20,840 on daily newspapers. My department is currently conducting a review of the provision of newspapers versus on-line subscriptions. The Minister for Transport, Tourism and Sport Shane Ross said ​his department spent €13,234 on daily newspapers. Daily newspapers are only supplied to ministers, their advisors, the press office and the press cutting service which distributes articles relating to the department on the internal website. The expenditure is in my view appropriate to ensure effective monitoring of the print media,” Ross said. Minister for Jobs, Innovation and Enterprise Mary Mitchell O’Connor said the expenditure on hard copy newspapers last year was €21,530. The newspapers were purchased in respect of the offices of the minister, ministers of state, the press office, office of the Secretary General, members of the management board and include a number of business newspapers for divisional use. In 2015, her department purchased 10 online subscriptions to three daily newspapers at a total cost of €2,139. The purchase of hard-copy and online subscriptions to daily newspapers was authorised in accordance with procedures that were introduced in the department in 2008 that significantly reduced the annual expenditure on newspapers. The Department of Defence spent €7,164.65 on daily newspapers last year. A total of €2,819.71 is spent by the Department of Children and Youth Affairs. Minister for Children and Youth Affairs Katherine Zappone said she is aware of the range of online facilities, adding that her department does avail of some. Email “Enda Kenny is saving money by reading more news online”. Feedback on “Enda Kenny is saving money by reading more news online”.